My weekend was pretty average / low-key. It started off with a bang on Friday afternoon when I got my results for my June Journalism and Media Studies exam. I passed and actually did better than I anticipated. On Saturday, my mum and I were invited over to a friends place for lunch…we had the most delicious food ever! For the rest of the week-end, I just relaxed and did some work that kept me busy. This coming week should be a bit more tight as I have to film my individual 6minute documentary. I am doing a kind of profile on an outstanding woman from East London - Lesley Anne Foster. She is responsible for establishing the Masimanyane Women’s Support Centre in East London and has done a tremendous amount of work for women and children abuse. 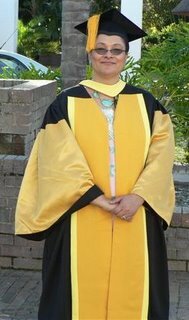 She was recently nominated for a Nobel Peace Prize and earlier this year, she was presented an honorary doctorate by Fort Hare University. She is a lady that I so respect and admire, so it’s truly an honour for me to be doing this mini-doccie on her. I hope everyone has a fantastic week ;) I just have a few days left before I head back to campus for the final semester of 2006!